These are my projects for the Final Round of the Stampin' Champion Contest at JustRite. Thanks to your votes from Round 2 of the JustRite Contest that moved me to the finals. For this round we were asked to create 1 3D item and a card using any JustRite products. I'm excited to share the projects I created with you using my JustRite Stampers. JustRite is having everyone vote on their favorite project of those that made it to the finals - the stakes are high and I sure could use your help with a vote for my project. I have a chance to win some fabulous prizes donated by various sponsors. Please be sure to head over to the JustRite Blog and tell everyone you know to go vote. Thanks so much for your support! For my 3D item - I created a Faux Patchwork purse. 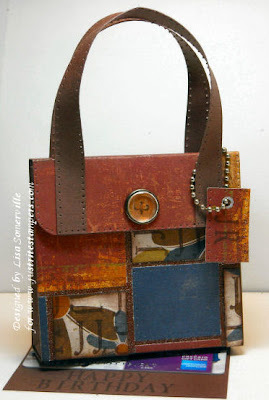 My inspiration for my purse came from the Coach patchwork purses. I used the Designer Tiles Technique from the TJNL to create the patchwork. 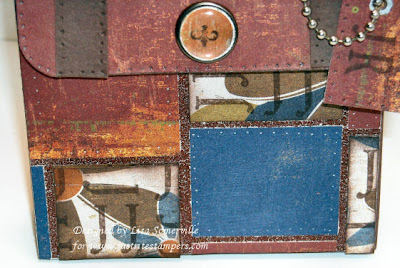 I stamped the "J" with the Small Round Monogram Stamper on some of my tiles, to mimic the look of the Coach purses. I also used these stamps to stamp the "JR" on the tag and part of the Damask Border from this set was used in the center of my Build-a-Brad to accent the purse closure. I created my template big enough so that this purse could hold 3"x3" cards, or a gift card attached to a piece of card stock as shown in my project. I used the JustRite Times New Roman Font to spell out "Happy Birthday" under my gift card. 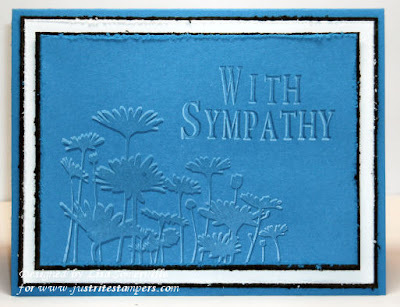 For my card I used JustRite Times New Roman Font to spell out and stamp "With Sympathy"- this shows just how versatile the monograms can be. Both the sentiment and the flowers were done using the Faux Dry Embossing Technique. You are a wonderful artist, an inspiration I have enjoyed visiting your blog and seeing your posts on Technique Junkies. You've just about sold me on the JustRite stamper, I just have to decide what and how much to start out with. Fabulous enteries Lisa, good luck! As usual, Lady, you have done a fantastic job. Best of luck! Love your purse, Lisa, and the faux embossed card is wonderful! Lisa, I'm glad I stopped in tonight! WOW! I Love ALL of your entries and wish you the best of luck!! wow!! good luck!! this is just fabulous! The purse is awesome! :) I just love it! Your card is also very pretty...I love that technique. Good luck in the contest! I'm dying to know what the Faux dry embossing technique is ... I've never seen or heard of it before .... do you have any directions or can you point me in the right direction to figure out how to do that? Thanks so much!